Testing rescue USB: how to boot? No, in fact that would be a bad thing to do in this case. That's how you'd configure your motherboard to allow Legacy BIOS booting if you needed to boot something that didn't support UEFI with Secure Boot, but Rescue Media built on WinPE 4 and newer supports that, so you don't need to do any of that. Taking those steps to boot Rescue Media would actually increase the chances of problems, because you want to make sure you boot your Rescue Media the same way you boot your OS. In many cases it doesn't matter, but if you ever need to run the Fix Boot Problems routine, the steps that routine performs depends on how the Rescue Media itself was booted, so if you configure your motherboard to allow Legacy BIOS booting and boot your Rescue Media that way even though your regular OS is set up to boot in UEFI mode, Fix Boot Problems will attempt the wrong steps. The ideal way to boot from a temporarily attached USB device is to access a "one-time boot menu" that many systems and motherboards offer. That allows you to press a key during startup that brings up a menu of devices to boot, and your selection there only applies to that specific boot attempt. It's more efficient than rearranging the boot order to boot perhaps only once from a USB device, and then having to go back and set it back to normal later. Does your motherboard have something like that? If not, you might have to deal with rearranging the boot order, but in many UEFI implementations, USB devices aren't even listed in the boot order because of differences between UEFI and Legacy BIOS booting. Ok, in addition to my earlier post, I found this thread on the ASUS ROG forums, in particular Post #9. 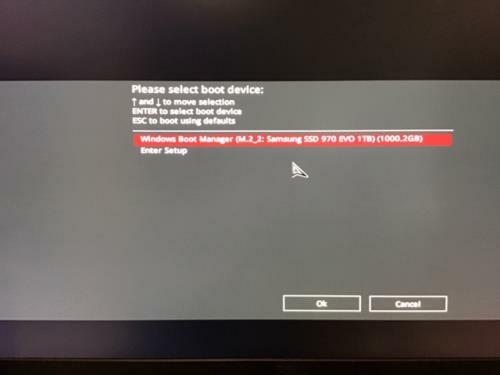 Basically, it appears that if you want to boot external devices in UEFI mode, you need to have them connected (or a disc inserted) before you enter the BIOS Setup. That way, the BIOS will scan any available devices/media for UEFI bootloaders and include them in the boot list that you can then rearrange. 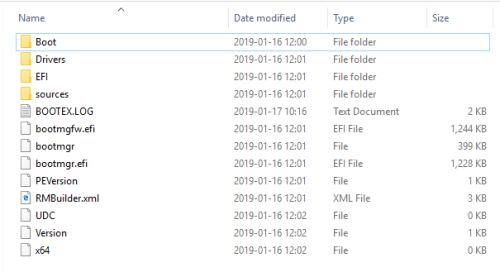 In other UEFI implementations I've seen, boot options that reside on local storage devices (other than optical drives) are only listed in the boot order if they've actually been registered into the UEFI firmware, and that registration consists of a path to a specific bootloader file on a specific partition of a specific device. By comparison, the contents of the one-time boot menu populates dynamically based on what's actually present at the time. It looks like the ASUS implementation instead populates the BIOS Setup boot options dynamically. That seems a bit awkward, because if I move my USB Rescue Media to the top of the boot list, then disconnect it later, it will disappear -- so what happens if I reconnect it later? Does it reappear at the top of the boot order list, suggesting that it was still there and simply hidden, or does it end up at the bottom because missing boot options actually get deleted? In my own (incomplete) defense, I was actually reading those pages from the motherboard manual, but still managed to miss the very last part of section 1.8. You have more patience than do I. I will play with the F8 function while the USB drive is installed and then without it being installed and post back. If you don't hear anything it means I haven't been able to find the OS drive after removing the USB stick! 3871358976 bytes total disk space. 16384 bytes in 1 hidden files. 1409024 bytes in 86 folders. 794443776 bytes in 234 files. 3075473408 bytes available on disk. 16384 bytes in each allocation unit. 236289 total allocation units on disk. 187712 allocation units available on disk. Just to make sure, did you already have the flash drive attached when the system was first starting? You can't insert it while the boot menu is displayed. If that's not the issue, the UEFI bootloader file you need in order to boot in UEFI mode should in the \EFI\Boot folder and be named Bootx64.efi. If you don't have that file on your Rescue Media, go to Rescue Media Builder and click Advanced. Under the Options tab, make sure you're building 64-bit media rather than 32-bit. Then go over to the Choose Base WIM tab and make sure you're using either WinPE 4 or newer. WinPE 3.1 doesn't support UEFI booting. If you have WinRE selected there, then as long as your system is running Windows 8 or above, that option is fine. 1. Flash drive was already attached at start of reboot. I just rebuilt the media and will try again. Just tried again with rebuilt flash drive but issue persists. Can you try a different flash drive? I know that some flash drives seem not to like booting, at least on some systems. And even though it would be less convenient, as a test try going into the BIOS Setup to check the boot order and see if it appears there.